CJ decided to join me on the first half of this hike, and I held out hope he might do the whole thing with me. We got to the trailhead, checked out gear, put on sunscreen, and started hiking downhill around 7am. We saw a sign that said the trail followed the road for 0.7 mile – the pavement was quite old and broken. I assume it was put in during the last depression in the 1930s, but I have no idea where the ‘road’ ever went. We had to cross a number of creeks and streams since the winter had been so wet. Fortunately there weren’t too many mosquitoes out yet. It didn’t take too long before we could take off our outer layers. We had to go under, over, or around several downed trees on the hike, a number that grew to a few dozen before the end of the day. Some of the trees had come down this winter, but some had obviously been down for a few years. These trails were not quite as well maintained as the more popular trails. We reached North Dome itself just before 9am, and found a pair of campers who were just breaking camp. We had them take our picture before heading out onto the Dome. A pair of hikers caught up to us as we were having our pictures taken, so there were 6 of us out on the dome. Last time I was on North Dome I had to borrow a camera from a pair of campers, and I didn’t take too long on the dome. This time I spent nearly an hour trapsing all over the Dome trying to find the best locations for picture taking. One pair of backpackers had camped on the trail nearby, and were headed over to Vernal Falls later in the day. I looked at their map and determined that we were seeing Illiouette Falls, not Vernel Falls. I had never noticed this waterfall before, though earlier this month on my Clouds Rest hike I had heard it and noticed the considerable volume of water coming down the side canyon into the Merced. Click here for a panorama from North Dome. North Dome is half a mile off the main trail. We climbed back onto the trail, then hiked a few minutes toward Yosemite Point where we had an excellent view of the valley and took a snack break. After our break the trail soon heads into the trees and eventually runs back into the main trail between Tioga Road and Yosemite Falls. 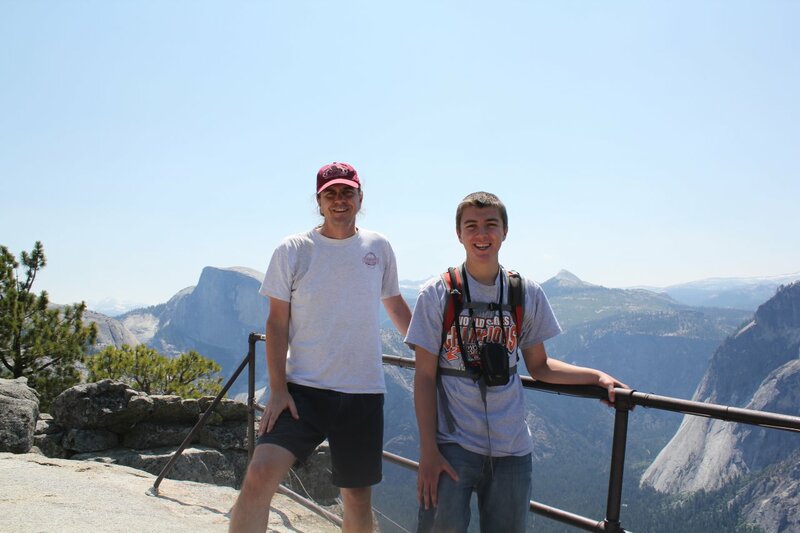 CJ and I talked about his classes and aspirations for a while before we got to Yosemite Point, where we took even more pictures and had lunch. 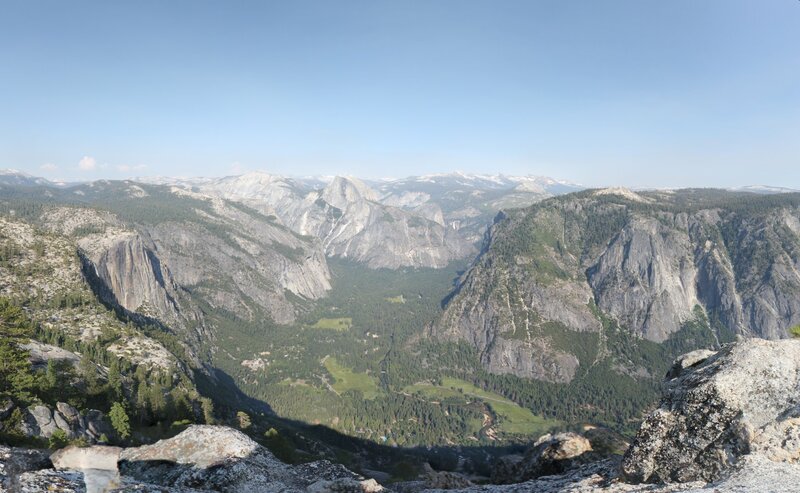 Click here for a panorama from Yosemite Point. I again lost the trail between Yosemite Point and Yosemite Falls but was lost only for about 10 minutes this time, which was an improvement. 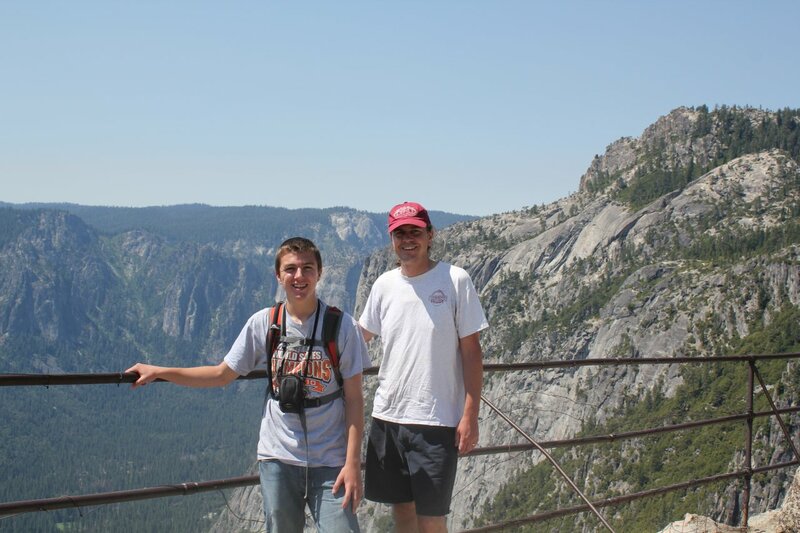 We hiked out to the Yosemite Falls overlook and I showed CJ the very very narrow ledge trail down to overlook. I assumed CJ would not want to walk out on the ledge, but I was wrong – he told me to go ahead, so I did, and he followed. About half a dozen of us crazy enough to walk down the ledge trail and look over the falls took pictures of each other. Occasionally we got wet as the wind blew water from the falls back up at us. CJ and I stayed at the overlook for about 10 minutes before climbing back up to the trail, then down to the intersection where the trail went either down to the valley or up to Tioga Road. I tried one last time to talk CJ into following be to El Capitan before we said our goodbyes and I hiked up while he hiked down. CJ ended up getting to the campsite safely at around 3pm. The trail up from that point was new to me – the trail quickly heads into the trees. I met 5 people coming down in the 0.6 mile before the intersection with the El Capitan trail. I assume from these folks had all climbed Eagle Peak but didn’t ask. The trail toward El Capitan and Eagle Peak climbs very slowly in the trees again crossing streams several times – it was quite a nice trail. After a while the mosquitoes got to be a bit much, and unfortunately I had forgotten the bug spray. Perhaps an hour after I left CJ I got to the Eagle Peak trailhead and met three young guys - backpackers – who were taking a break. They had been on El Capitan, but were not headed up to Eagle Peak. 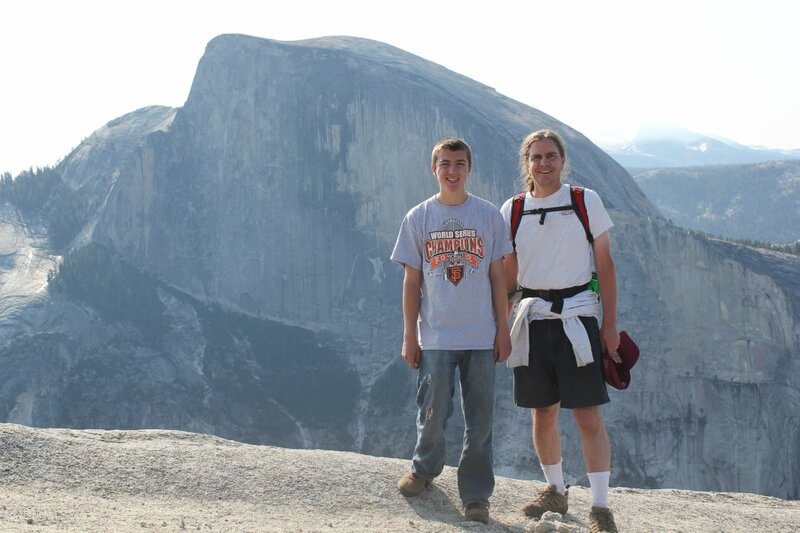 There were spending the night at Yosemite Point, then the next night at North Dome. They were fun to talk with, and they let me use their bug spray, which helped considerably. 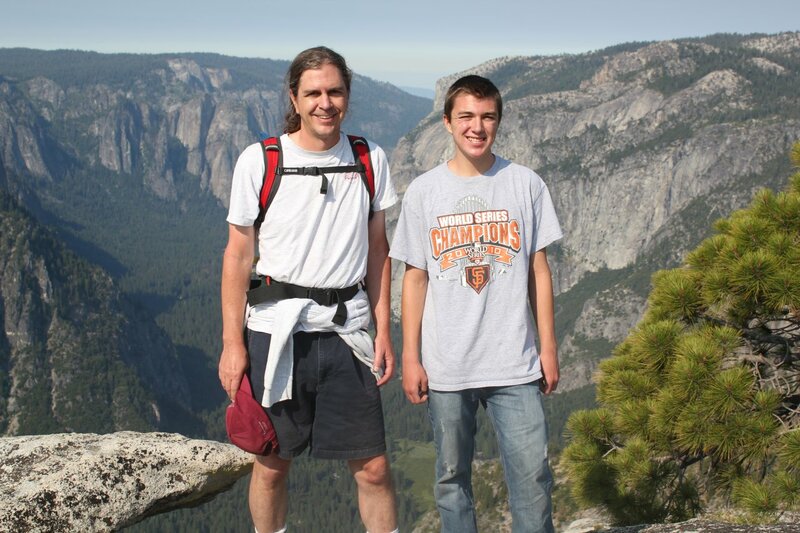 Including these hikers I had run into about 10 people since starting up the trail from the top of Yosemite Falls. Immediately after the junction of the Eagle Peak trail, the trail to El Capitan heads downhill quickly… then uphill quickly. 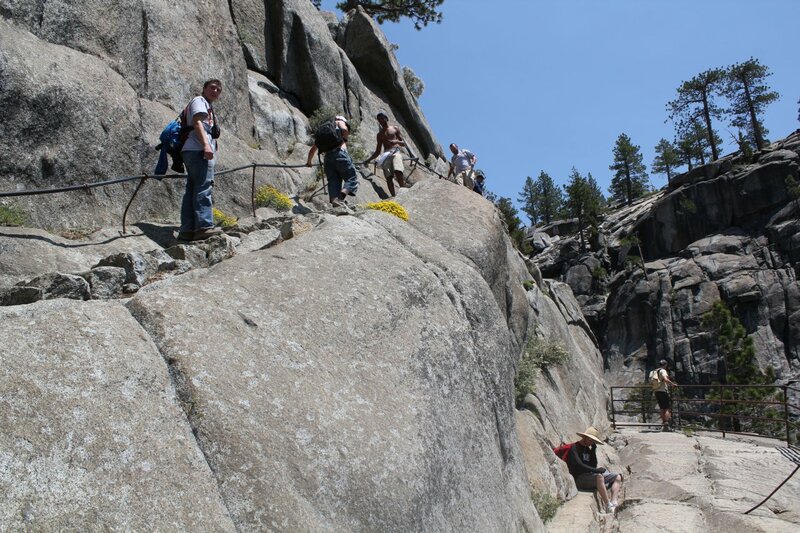 It was a very stark contrast to the easy section of trail between Yosemite Falls and the Eagle Peak trailhead. After perhaps another hour I finally saw the top of huge piece of rock that could only be El Capitan. It was a bit confusing, because the top was sloped, with no sheer walls visible, and the trail out to the end of El Capitan was not marked with any signs. The top of El Capitan almost looks like a runway it is so huge. I saw three people lounging under trees in two groups – I had assumed I would find climbers celebrating their climbs on top, but I only found other hikers. Leaving no dome unexplored, I ventured down the front of El Capitan to find a 3000’ sheer granite wall somewhere. After perhaps 15 minutes of ill advised bushwhacking I decided there was no way to see sheer granite walls without a climbing rope and a lot more time, knowledge and gear than I had available and headed back up to the top of the dome. I spoke with one of the two remaining hikers for a while and had him take my picture. 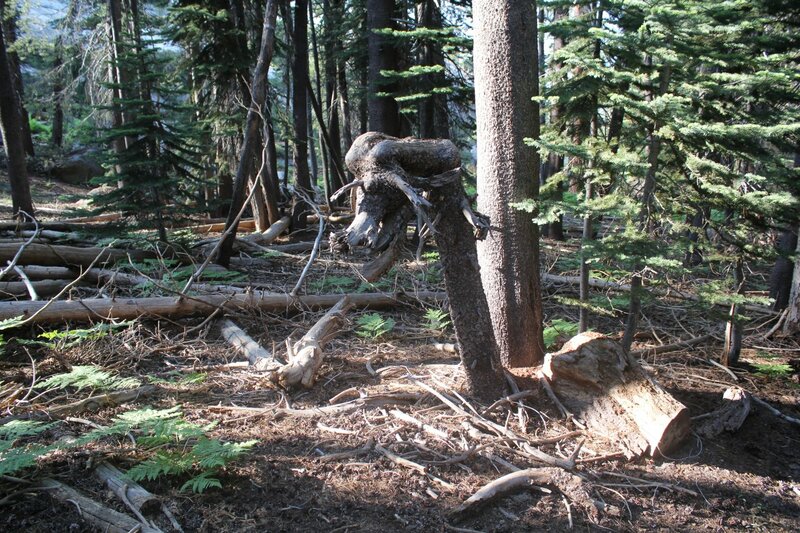 They had hiked in 8 miles from Tamarack campground – the other direction from my hike. 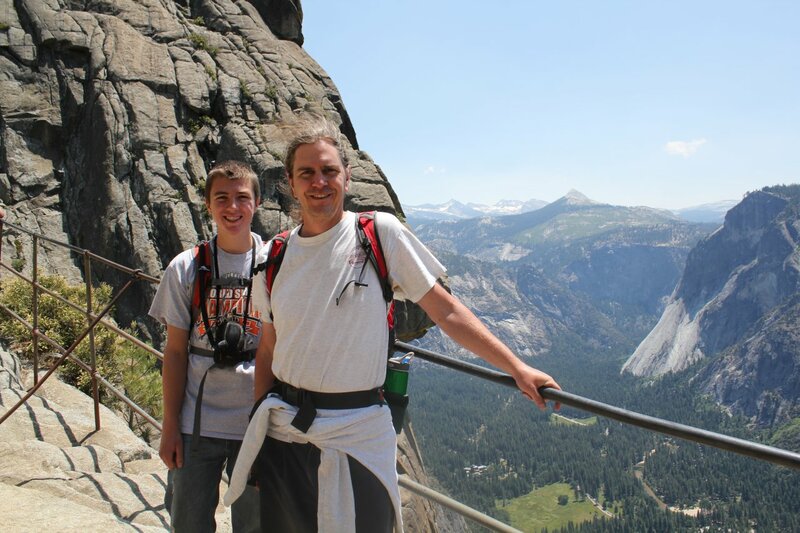 They were from back east and had a few more days to spend in Yosemite, so I gave him plenty of advice about what to see in Yosemite Valley before we each went our separate ways. It was 3:40pm, and it was now fairly obvious that I was the last one on the trail between El Capitan and Yosemite Falls. After about half an hour I caught up to a single hiker – I could hear him before I could see him, which is always interesting in the middle of the wilderness. I hiked behind up until I was perhaps only 100’ from him before announcing myself – he must have been hard of hearing, I had heard him minutes before he heard me. I startled him when I asked how he was doing, but he was VERY thankful to see another person. He was older than me and spoke with a Spanish (I believe Spain, not Latin American) accent. 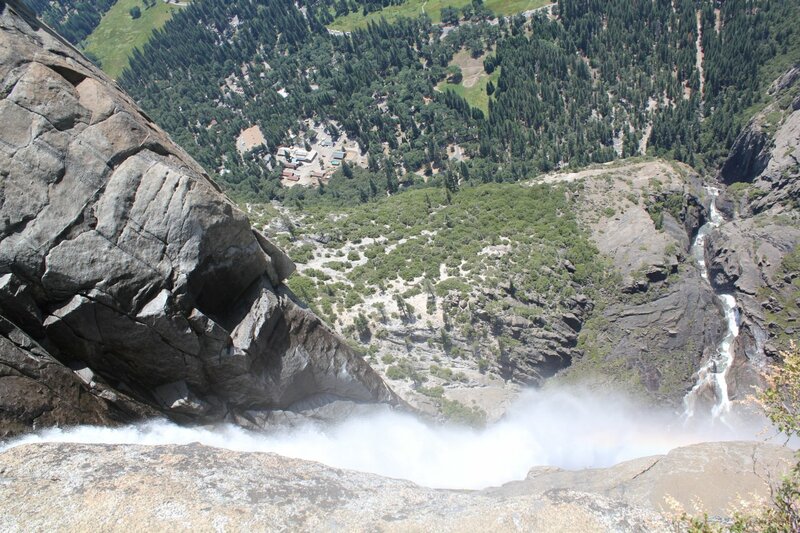 He indicated that he had lost the trail coming off of El Capitan, and was very thankful to have found it again. I assume he was the third person I had seen when I first got to El Capitan, but I never asked him. The trails on top of El Capitan were lined with small rocks and a few larger cairns to mark them – I made a point of following the trails to avoid getting lost, which would have been relatively easy. We hiked together until we reached the trailhead to Eagle Peak, where I indicated I was going up. He had already been up Eagle Peak, so we parted ways. I assumed I was the only one on Eagle Peak. The map in the Tuolumne Meadow store indicated it was 0.8 miles from the trailhead to the top of Eagle Peak, but the sign on the trail said it was only 0.3 miles. I had never seen an incorrect sign in Yosemite, so I was quite relieved to have one less mile to hike. 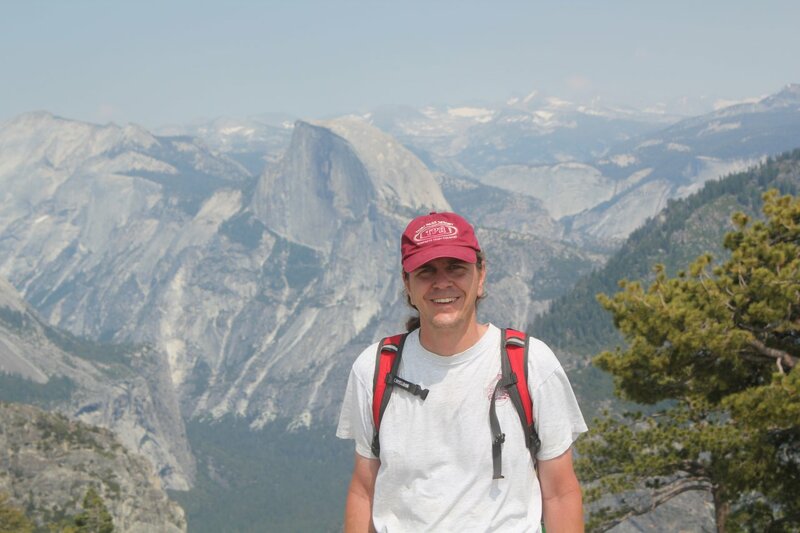 As I kept hiking up Eagle Peak, however, I began to think I had hiked over 0.3 miles…uphill…. these things are never easy to figure out. After a false summit or two I finally reached what appeared to be the end of the line, and after a brief scramble I was on top of the world. The dropoff to the south and east appeared to be not quite sheer, but well over 1000’ total. The view was simply breathtaking. I later read the John Muir called Eagle Peak the best view of Yosemite Valley, and I have to agree. Before now, I had considered the view from North Dome to be the best view I had ever seen. This clearly topped it, and I had it all to myself. I took lots of pictures, called Kathy to tell her I thought I would be down in 2-1/2 hours or so. That was optimistic. 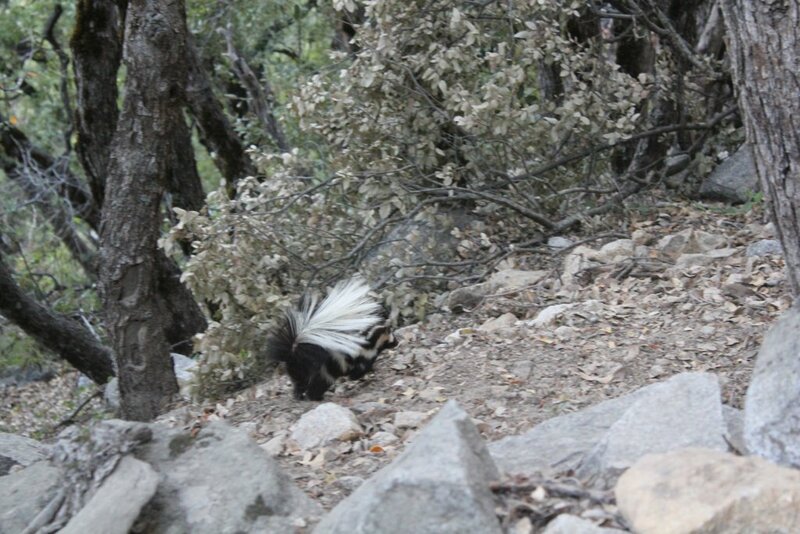 Below Upper Yosemite Falls I saw a skunk off the trail. It took me until just after 8pm to get down the valley floor.